In Southern California, it’s really not uncommon to see a fast, good-looking car pass you by. In fact, if anything, it’s more common to see a nice sports car than it is not to see a somewhat expensive vehicle (and we’re not just talking about Beverly Hills, either). In a place where Lamborghinis and Ferraris are somewhat commonplace, this means that your run-of-the-mill 911 blends in really, really well. Truly, you’d have no issues parking your Porsche in the grocery store parking lot for a while. Throughout our blog posts, we mostly touch on the same four or five Porsche models (representative of Porsche’s current lineup): the Carrera, 718 (Cayman and Boxster), the Panamera, the Macan, and the Cayenne. These vehicles are a joy to drive and work on, but at this point, it’s fair to say that we’re pretty used to them. It’s also fair to say that they’re only a sliver of all of the vehicles that Porsche has brainstormed or developed over time. That’s why we’re taking a look at some of Porsche’s concept vehicles over time that never really made it past the drawing board. 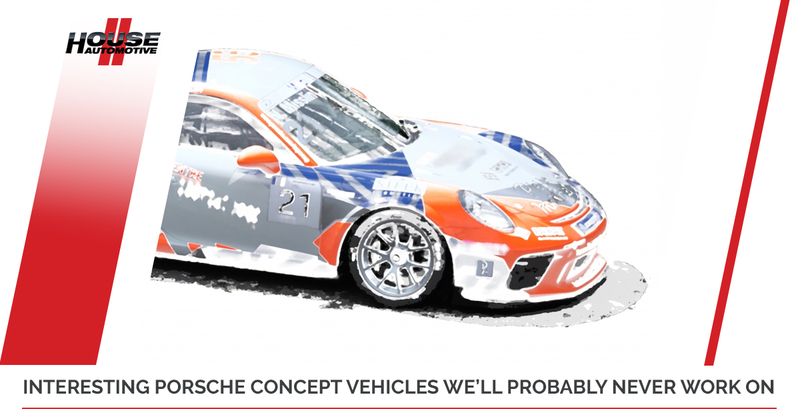 It’s a true shame that we’ll never actually see any of these models roll through our Porsche repair center, but hey, we can still dream about it…right? For all of your Porsche needs on actual models that exist on the road, our team has you covered. Let’s take a look at a few Porsche concepts. When you hear the term “concept vehicle,” you’re probably thinking “futuristic-looking,” and this concept certainly doesn’t disappoint. Palestinian designer Arthur B. Nustas created the RSR variant of the 939 model, and from all angles, it looks absolutely stunning. Drawing inspiration from Porsche’s OG 356 (their first official model), you can see Porsche’s roots in this concept design except that it also looks like it’s from the year 2052. The 960 is a special concept case because it’s rumored that this supercar might actually be slated for production in 2019 or 2020, but it’s unclear as to what the official word is. The idea is that the 960 would serve as a reasonable (albeit still pricey) midpoint between the 911 Turbo S and the 918 Spyder, essentially Porsche’s flagship road-ready supercar. We’re sure that if you’re going to spend over a quarter million dollars on a vehicle, you’re going to appreciate more options and hopefully the 960 suffices as a viable model from Porsche. Sometimes, automotive designers draft up vehicles just for the sake of being creative. Other times, they do it as part of a portfolio to present to an automotive company, and that’s the case with Anthony Colard and the 921. It took him two weeks to create this design and, well, he knocked it out of the park. Design elements include parts of the current Boxster/Cayman as well as the 928, offering sleek looks that we wish existed in real life. Unfortunately, the design never went any further than a concept in a software program. OK, you got us — the 917 isn’t technically a concept vehicle more so than it is a sports prototype race car. At least, it was a prototype race car that was produced between 1969 and 1971. Only 25 original units were built with another 12 built as a follow-up. Fortunately, the 917 provided Porsche with its very first victories at the 24 Hours of Le Mans race in 1970 and 1971; that’s a huge deal in the motoring circuit. Can you even imagine going 0-124 mph in 5.3 seconds? That’s what the 917 was capable of doing and that was back in the early 70s. Incredible. Imagine an even better-looking version of the Panamera…that doesn’t exist in the production world. As cool as it would be to have doors that hinge from the rear fenders, we’ll patiently wait for something like this to roll through our shop several decades from now. Obviously, we can only work on real Porsche models, but it’s fun to think about what we could repair. Schedule an appointment today at HOUSE Automotive for unparalleled independent Porsche service.